As the economy enters its tenth year of growth since the last recession, we look at just how far we’ve come. We will soon begin the tenth year of economic expansion since the last recession ended. According to the National Bureau of Economic Research, the recovery from the last recession began in July 2009. With most of our tea-leaves pointing toward continued growth, we thought a look back at where we’ve come from is appropriate. Amid the turmoil of the Great Recession and 2009 Financial Crisis, the economy and financial markets were in distress. The U.S. unemployment rate was soaring toward 10%, the Dow Jones Industrial Average had fallen by more than 50%, and rescue efforts were underway. The government and central banks had pumped over $10 trillion into the economy via loans, backstops, and guarantees. Extraordinary measures were undertaken by the Fed to provide emergency liquidity to struggling credit markets. How different the world seems today, as evidenced by the charts below. Last week’s May employment report showed further job gains. Nearly 148 million people are employed in the United States, an increase of 17 million from the start of the recovery in mid-2009. Along with more jobs comes more income, which in turn, feeds overall demand. Household income now stands near $14.5 trillion, a 30% increase since the recovery began. Business profits grew along with greater demand for goods and services, too. Economy-wide corporate profits are near $2.2 trillion today. This is a 70% improvement compared to just $1.3 trillion in the second quarter 2009. Because stock prices tend to follow profits, we should not be surprised to see the Dow Jones Industrial Average closing in on 28,000 versus roughly 6,000-11,000 during the 2008-2009 bear market trough. 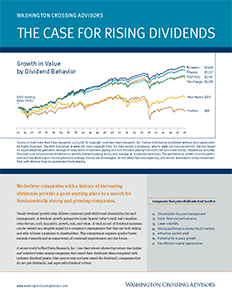 Rising asset prices, led by stocks, has allowed U.S. households to improve their balance sheets. According to data from the Federal Reserve, household net worth is nearly at record $100 trillion. This marks the largest ever gain in wealth during a cycle, and a staggering 80% improvement from the low-water-mark in 2009. This expansion is not yet the longest on record. That honor belongs to the 1990s-era expansion. That period of extraordinary growth began in March 1991 and ended ten years later in March 2001. Should the current period of growth persist for another year, the current expansion would become the longest on record. For now, we recognize the significant changes that are occurring in markets and across the economy. Growth continues, labor markets are tighter, commodity markets are showing signs of price pressure, and interest rates are ratcheting higher. Each of these things are both evidence of the progress that has been made and inputs to deciding what happens next. For now, our indicators are well-behaved, which makes it all the more likely the economy remains on a growth path for at least awhile longer. WCA Fundamental Conditions Barometer Description: We regularly assess changes in fundamental conditions to help guide near-term asset allocation decisions. 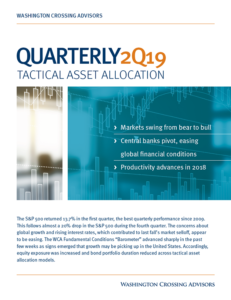 The analysis incorporates approximately 30 forward-looking indicators in categories ranging from Credit and Capital Markets to U.S. Economic Conditions and Foreign Conditions. From each category of data, we create three diffusion-style sub-indices that measure the trends in the underlying data. Sustained improvement that is spread across a wide variety of observations will produce index readings above 50 (potentially favoring stocks); while readings below 50 would indicate potential deterioration (potentially favoring bonds). The WCA Fundamental Conditions Index combines the three underlying categories into a single summary measure. This measure can be thought of as a “barometer” for changes in fundamental conditions. The Dow Jones Industrial Average is an index that shows how 30 large, publicly owned companies based in the United States have traded during a standard trading session in the stock market.